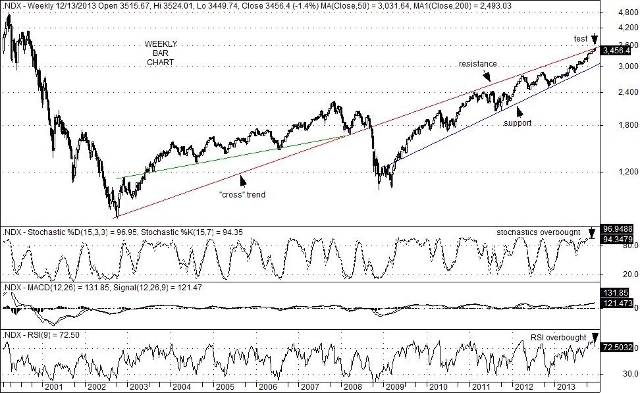 Is the NASDAQ 100 Index Ready to Begin A Correction? When looking at the weekly chart of the NASDAQ 100 Index (NDX) it is easy to see that it is now testing key trend line resistance at the 3,524 level accompanied by overbought conditions. In particular, weekly stochastic studies are in a very overbought condition with %D and %K readings of nearly 97 and 94.35 respectively. And while overbought conditions can persist for a long time, the unease over the timing and size of the anticipated taper coupled with a change at the helm of the Federal Reserve itself might just be the reason (or excuse) for investors to take profits and trim positions. Still, an extended rise in longer-term interest rates, whether as a result of a strengthening economy or as a result of a reduction in security purchases buy the Fed, could have an adverse impact on home purchases and related product sales. If a correction in the NDX were to occur, some attention should be paid to some of its key components including: Amazon.com (AMZN); Facebook (FB); Google (GOOG); priceline.com (PCLN); Seagate Technology (STX); and Western Digital (WDC) which are each trading near their all-time highs. A pullback or two within this group of names might be seen as a hint that a more broad-based decline could be at hand. In any event, key support for the NASDAQ 100 currently sits at the 3,039 level representing a potential 491-point drop (or a 13.9% pullback) if a sharp correction were to unfold. Over time, however, this trend line will rise and therefore mitigate the potential severity of a setback on the margin. That being said, the big surprise in this entire scenario would be a solid break above key resistance currently at the 3,530 level occurs which, in turn, would likely catch a number of investors/traders/analysts very much off sides. Nevertheless, the technical set-up does favor the odds for a corrective pullback to unfold over the short-term. This entry was posted on Thursday, December 19th, 2013 at 12:51 am	and is filed under NASDAQ 100 Index (NDX). You can follow any responses to this entry through the RSS 2.0 feed. You can leave a response, or trackback from your own site.